Adventure Tours Key Largo: What Are They? Do you crave exploration? Are you ready to try new experiences? Do you thirst for adventure? If you answered yes to any (or all) of these questions, it’s time to embrace your inner hobbit and go on an adventure — adventure tour, that is! Instead of picking a direction, striking out without a plan, and getting hopelessly lost, adventure tours are a great way to experience new things and explore like the intrepid traveler you are. They’re an option created for those who want to add a bit more excitement to a vacation or simply see their local area in a new light — and possibly from a whole new vantage point. But what are adventure tours, exactly? When you’re traveling to a new place, it makes sense that you want to get out and wander. It’s a great way to learn about an area. However, it can be hard to figure out local laws and customs so you can understand where you are or are not allowed to explore. Adventure tours are designed to help you explore to your heart’s content, and the planning provided means you can do that exploration safely. Adventure tours are a pretty broad category, and options will vary based on location. For example, if you’re visiting a mountain locale, a local adventure tour may include camping, hiking, and bouldering or rock climbing. Or, if you’re visiting historically rich areas, an adventure tour may include visits to notable historical sites, taking part in culturally significant celebrations, and other related experiences. Here in Key Largo, our adventure tours tend to highlight the beauty of our surroundings and give you the means to explore all the different ecosystems that make our area unique. Key Largo, and the Florida Keys in general, are best explored by water. However, that can get a bit complicated when you want to cruise the coastline, jut out and see North America’s only living coral reefs, and spend some time getting (intentionally) lost in the mangrove trails. Adventure tours in the area give you a way to experience all of these vastly different areas. For example, a jet ski rental gives you the freedom to cruise up and down the Keys. However, a jet ski limits how far into the mangroves you can explore, and you will need to be careful when taking jet skis out to the reefs. A kayak rental or tour may not be the best option if you want to travel the length of the Keys — that’s a heck of a lot of paddling — but it’s a better option for delving deeper into the mangroves or taking some time to snorkel around the reefs. Then, if you want a whole new experience, parasailing tours give you a bird’s eye view of the area for yet another way to experience all that is Key Largo. If that sounds like your kind of adventure, it’s time to get planning. Keys Skis & Adventure offers jet ski rentals and tours, kayak rentals and tours, parasailing, and bike rentals. 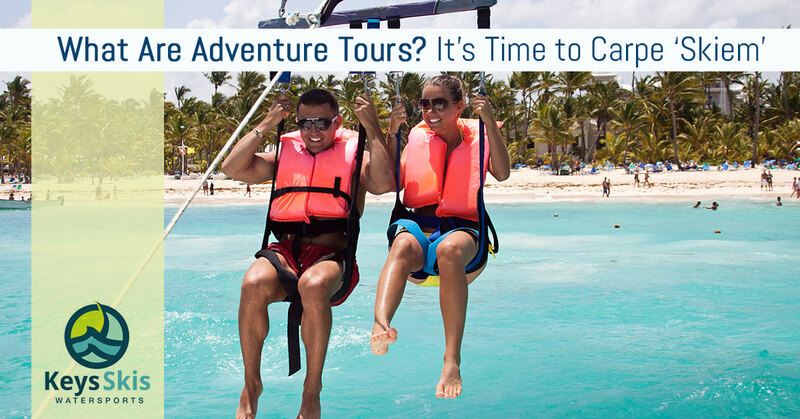 Check out our all-in-one package, or contact us about creating the adventure tour that meets your needs.